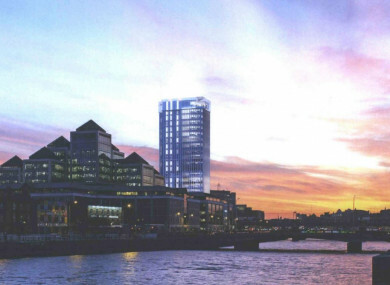 An Bord Pleanála has granted permission with conditions for the 22-storey building on the banks of the Liffey. A mock up from the planners on what it'll look like. AN BORD PLEANÁLA has granted permission for the construction of a 22-storey building in Dublin’s city centre, in a landmark ruling that paves the way for the high-rise building on the banks of the Liffey. Company Tanat Ltd, run by high-profile Celtic Tiger developer Johnny Ronan, first applied for planning permission for the building back in 2017 but faced a series of knockbacks from Dublin City Council and An Bord Pleanála. Following another appeal, An Bord Pleanála decided this week to grant permission for the development with a number of conditions. An Taisce had lodged objections to the plan, and has said that the granting of permission is a “catastrophic error”, which will cause “irrevocable damage” to the city’s character. In June 2017, Ronan filed for permission to build an 88 metre-tall tower on a site adjoining Tara Street Dart Station. If built at this height, it’ll become Ireland’s tallest building. The plans included a 110-bedroom hotel and a rooftop bar. Dublin council refused planning permission on the grounds the tower would “seriously detract” from the character of Custom House, which it called “one of the city’s most important architectural set pieces”. The council also noted that the scale of the project would “have an adverse and detrimental impact on the River Liffey conservation area and the O’Connell Street and environs architectural conservation area”. Ronan appealed the case to An Bord Pleanála, which also ruled against him last March. An Bord Pleanála echoed the sentiments of Dublin council when it said the building is in an ”important location within the historic city core” and that the development would detract from the “character of the Custom House”. The development would also visually impose on Lord Edward Street, the Five Lamps, Granby Row, Frederick Street North, Parnell Street North, Henrietta Street, Kildare Street and Harcourt Street, it said. This refusal, however, was at odds from the advice given by An Bord Pleanála’s senior planning inspector Gillian Kane. In a further appeal, however, Tanat were successful in their application with An Bord Pleanála deciding to grant permission last Tuesday. Supporters of the plan from the start included groups such as IDA Ireland and the National Transport Authority, while property consultancy firm Knight Frank said there was an “urgent need” for the building and it would help Dublin in the “international war for talent”. An Taisce, however, has said the ruling may have major repercussions for Dublin city. “Amid the general fiasco that has characterised Irish planning over the last 60 years, there was at least one achievement of maintaining Dublin as one of Europe’s low-rise major historic cities,” it said. “This is now lost. The allowing of highrise towers in the centre of Dublin is gravely erroneous. The city already has a highly defined identity of historic streets and squares, rivers and canals, grand public buildings and churches, plus its rich literary and artistic associations. An Taisce said it would have a negative impact on important conservation areas such as Trinity College, the Liffey Quays, College Green and O’Connell Street. “Long-established height protections for the historic centre of Dublin were recklessly scrapped in new guidelines brought in by Minister Eoghan Murphy last year,” it added. Last December, Murphy published new guidelines calling for local authorities to evaluate their current planning policies on taller buildings in urban areas. According to Murphy, “arbitrary” height caps on apartment buildings in cities don’t make any sense and don’t facilitate good planning and design. “This is as much about increasing the shoulder height of buildings in our town and city cores, as well as allowing for taller buildings across our skyline, that will add to the merit and functionality of our urban cores as places to live,” Murphy said in a statement. Our cities and our towns must grow upwards, not just outwards, if we are to meet the many challenges ahead. Email “After a two-year planning battle, Johnny Ronan's Dublin skyscraper has been given the green light”. Feedback on “After a two-year planning battle, Johnny Ronan's Dublin skyscraper has been given the green light”.